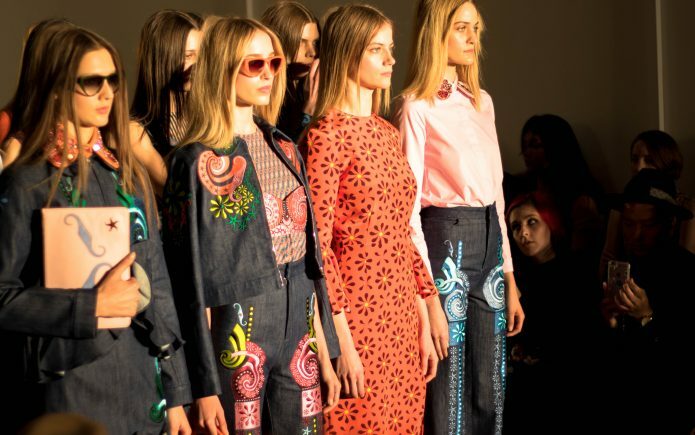 London Fashion Weekend AW 16, had great designers from the British fashion industry showcasing their collections and I was so thrilled to have attended designer Holly Fulton’s show. 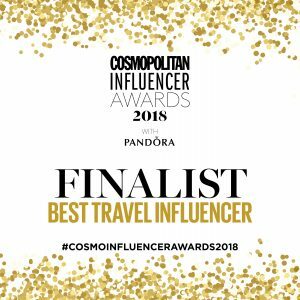 Holly Fulton has managed to make a name in the fashion industry pretty quickly since her fulminant debut in 2009 that has won her quite a few designer awards in 2010, amongst which Elle’s New Designer 2010 and Emerging Talent Accessories at British fashion awards 2010. Holly Fulton has a Master’s degree from the prestigious Royal College of Art and an unmistakeable style best described by modern luxury with plenty graphic applications and digitally manipulated prints that speak of an old era from a new, modern yet relaxed perspective. 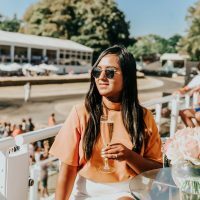 Her creations are congruent from top to bottom which depicts a mesh of art, history and the modern pop culture in outfits designed for confident and adventurous women. 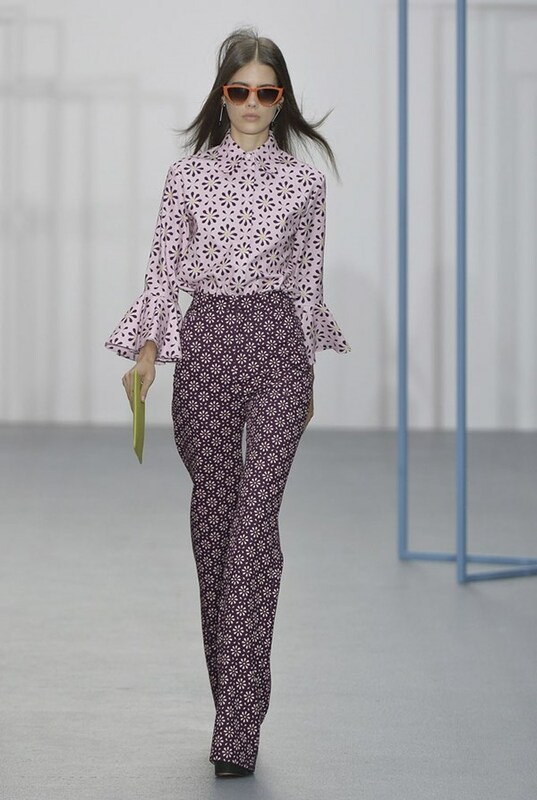 This season, Holly Fulton’s collection had large bouffant sleeves and the turtlenecks of the shirts speak of the peasant blouses of the last century while the floral prints add a bit of Eastern European feel to the garments. 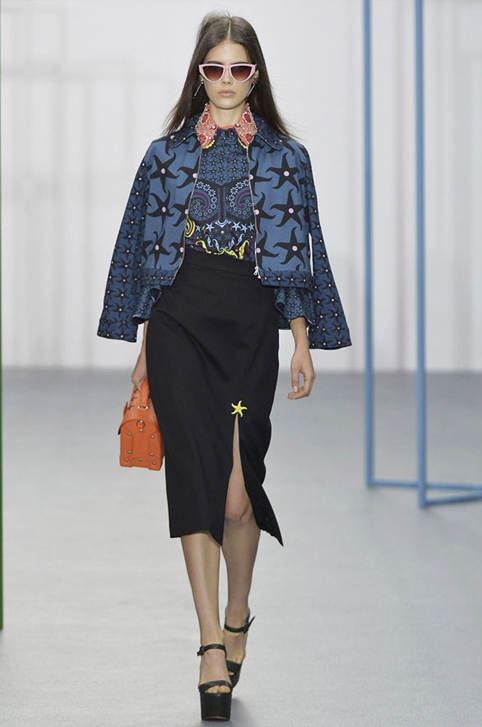 There is something very retro yet modern about Holly Fulton that brings, even more, novelty to the collections. Holly has managed to bring the retro era into the present modern times with large geometric and exquisite prints that are reinterpretations of late centuries motifs with a modern and personal twist from her creative style. Holly Fulton’s collection had great wearable pieces with outerwear taking the prime focus. Once again, Holly Fulton has managed to surprise everybody with the perfection in geometrical details, great tailoring as well as a unique mix of the medieval fashion with the modern pop culture in a very empowering fashion collection for women. Did you like Holly Fulton’s collection? Who is your favourite designer? Love her street-friendly collection – Have a fab week ahead! I just love all of the bold patterns that are going on! I am quite drawn to the bold prints. I love that second look you featured!! The second one is also one of my favourite. Wow! She hasn’t wasted any time making a name for herself. Love those shoes! I love the historic element she has in her designs. it really brings a whole new dimension to it. I agree with you, she brings in a whole new dimension. Gorgeous clothing. I love the patterns and the colors. That first dress is my favorite. Love these looks! Those prints are gorgeous – I especially love look #2! Those dresses are amazing. Very Scandinavian. I love her stuff, specially the bold pattern. She is great is she not? great post! I want to go to New York fashion week and London fashion week someday. Wow I think this is a gorgeous collection love the use of colors and shapes specially in the first dress! I love the prints and colors. She definitely has her own sense of style where I could pick out her clothing easily from others. These looks are fabulous. I am abig fan of color and some prints. This makes me want to go to a Fashion Week so badly! I really do like this collection for the most part. One of my favorite aspects is the fluffy bouffant sleeves on the blouses! I love the prints and the splashes of color. The clothes don’t look like they’re for AW at all because of that. They are beautiful! Very unique and striking looks. This is my first introduction to Holly Futon so thank you! That orange dress in the first photo is stunning. Love your pics – truly! NYC fashion week was AMAZE and I’m sure that London is just as incredible! The prints look gorgeous! Very retro, but still very chic. So glad to see those models, love their dresses and it’s really fashionable. That is such a stunning collection. I am especially loving all of the bold prints and how she didn’t shy away from pairing prints. 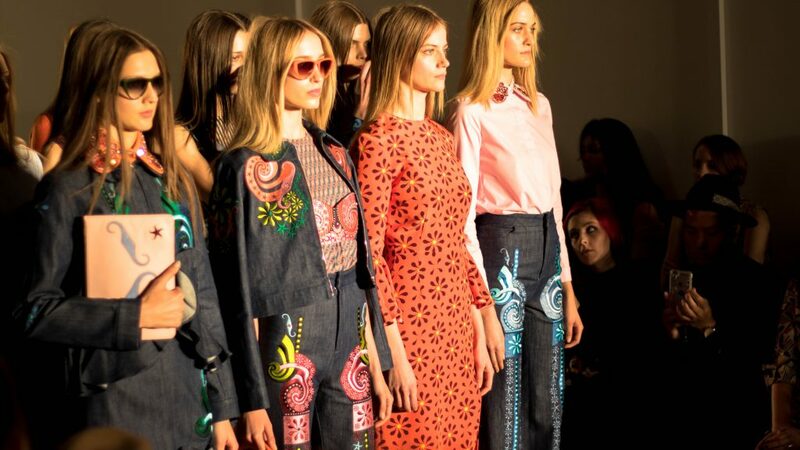 I like this Holly Fulton collection just my kind of outfits, So thansk for sharing Your London Fashion weekend!